The world envies Rhodes history, which is long and illustrious. The Minoans, the Greeks and the Romans all made the island prosperous and it was noted for its cultural and educational prowess very early on. Rhodes today is as much known for its incredible archaeological sites and medieval capital as it is for its beaches and resorts. Rhodes was settled way back in the Neolithic period - towards the end of the Stone Age, although little remains of this time. It was also home to the Minoans and noted for its Bronze Age settlements, which were followed by the establishment of the principal cities of Kamiros, Lindos and also Ialyssos, under the Dorian Greeks. These three cities all came together at the very end of the 5th century BC to build the capital Rhodes Town, which had a fine port from where ships would sail out all around the Mediterranean. The ruins of Kamiros are a major site today, dating from the 7th century BC, while the town of Lindos boasts the Temple of Athena from the 4th century BC and the 2nd-century Acropolis. 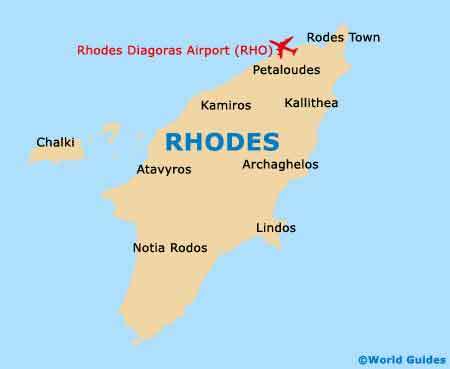 Of note, Rhodes Town is where you will find the Temple of Aphrodite. The island became an important centre for trade and education, producing such great minds as Hares, the creator of the magnificent Colossus of Rhodes. This monumental bronze statue of Helios, the sun god, hailed from 285 BC - the height of the island's power, and stood at the harbour for roughly half a century before succumbing to an earthquake. The Colossus would come to be known as one of the Seven Wonders of the World and is thought to have measured in at a staggering 30 metres / 100 feet high. Both the Persians and the Ptolemies had influence on the history of Rhodes, although the Romans had more of an impact after their arrival in 164 BC. The island prospered both educationally and monetarily, although relations soon soured and Roman senator Cassius sacked the capital. After the split of the Roman Empire, the Byzantines took control for several centuries. Post-Byzantine Rhodes flourished when it opened up to Western Europe under the Knights of St. John (Knights of Rhodes). It became wealthy into the 14th and 15th centuries, from which many of the island's monuments hail, including the Palace of the Grand Masters, the Church of Agios Ioannis at Lindos, and the Venetian castles of Kritinia and Monolithos. The Ottoman Turks came on the scene in the early 1520s, forcing the Knights out. They remained on the island for almost four centuries and did better here than many other of their Aegean exploits. The Jewish populace was, however, discriminated against and the Italians took over in 1912, followed by the Germans in WWII. The surrender of the Dodecanese islands left Rhodes in British hands after the war. Rhodes and the rest of the Dodecanese archipelago eventually became a part of Greece as recently as 1947. Its sunny disposition and attractive beaches brought in tourists from all over Europe, and today it draws in more holiday makers than any other island in Greece. The island has undeniable natural beauty, as well as numerous remarkable historic sites, many of which can be seen in the capital's stunning Old Town. Rhodes history can be appreciated in the mixture of cultures that lived here, as evidenced by its old buildings and its many distinctive, historic quarters. These include both the Turkish Quarter (Hora) and the Knights' Quarter (Kollakio), the latter of which is perhaps best known for being home to the Avenue of the Knights.